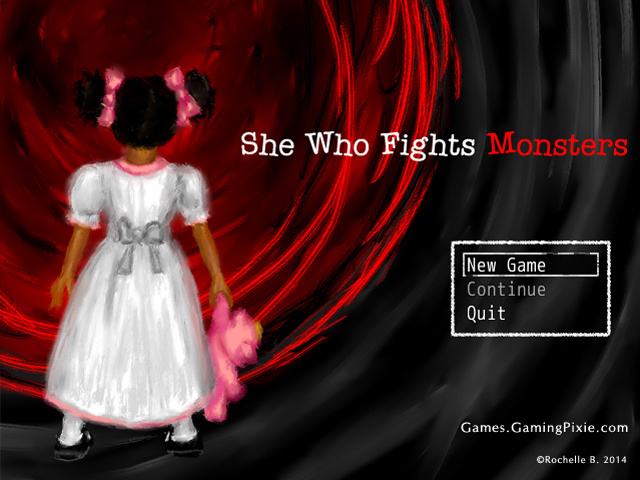 She Who Fights Monsters is a game by Gaming Pixie that uses the conventions of Japanese RPGs and survival horror games to tell a story of abuse. The story follows Jennifer, whose father suffers from alcoholism. This alcoholism can send her father into fits of rage where he will scream and hurl abuse at the young girl. While this abuse is not physical violence, we can see how the emotional and verbal abuse and intimidation tears apart the young girl just as violently. These fits of rage seem to have no logical origin. Any action Jennifer takes can trigger an attack, and the player can easily become caught up in the paranoia. The player may attempt to prevent Jennifer from doing things that her father can use as an excuse to become abusive, but the truth is that he doesn’t need an excuse. Jennifer will find herself facing a monster no matter what she does, and the player is no more able to decode what will keep her father happy and in “good father mode” than she is. From examining her memories during her down time, we know that Jennifer’s relationship with her father isn’t solely defined by alcoholism and abuse. We can receive glimpses into positive memories of her father taking her on trips, playing with her, and caring for her. Emotional abuse is so damaging because it isn’t as simple as coming solely from “monsters” but can come even from people who love and care for. But that doesn’t excuse abuse when it happens, and there is one particular memory of abuse that reaches the breaking point and forces Jennifer to throw aside all positive memories of her father. But even knowing that this memory has undone every positive memory in Jennifer’s mind, it is still us, the player, who decides if it undoes that knowledge for us. As the player, we can’t experience these positive memories of Jennifer. We are given static images of her drawings of these moments, and from that we can infer how much they meant to her, but we don’t experience them through direct action like the abusive moments. Meanwhile, those abusive moments play out in surreal horrorscapes where we run from shadowy figures, watch Jennifer rot and deteriorate before our eyes, and helplessly try and survive RPG-style battles against abstract horrors with only weapons and abilities like “tears” and “innocence” to defend ourselves with. This distinction between how we experience Jennifer’s positive and negative memories is important, because our decision at the end of the game as to how an adult Jennifer will approach her relationship to her parents is based on what we’ve seen and experienced, as well as what we’ve been told. We only get to experience the abuse first hand, but we can only guess and infer what the positive moments were like. As the game is made in RPG Maker VXA, it borrows a lot of rpg conventions such as the top-down perspective, menus and “battles.” From exploring Jennifer’s room, we learn that she uses fantasy as an escape. She’s very imaginative, and creates positive fantasy spaces to feel safe in. The fact that we can only recover the positive memories of her father in these spaces may indicate that they are part of her fantasy. On the other hand, it may indicate that it is only through escapist fantasy that she’s able to find the safety and space to think beyond the immediate horror of abuse. In this interpretation, fantasy is not merely a security blanket, but a method of survival and of making sense of reality. On one day when her father’s verbal rage is directed towards a fight with her mother, Jennifer hides in her room to play a video game. This game-within-a-game gives us more insight into how Jennifer lives. Her game is saved before the final dungeon, and her heroine is at maximum level and decked out in the best equipment possible. This is clearly a game she plays, or escapes to, a LOT. Yet despite her heroine’s power and equipment, it is really easy to die in this game. The final boss of this game cannot be beaten with simple grinding and button mashing, echoing the hopelessness of the battles against her father. Emotional abuse is not an easy subject to write about, much less to design a game about. It is even harder to live through. Leo Tolstoy famously wrote “All happy families are alike; each unhappy family is unhappy in its own way.” This is true to a point, but in my experience “unhappiness” tends to follow specific, repeated patterns. Abuse is such a pattern. It is sinister and damaging because of how it perpetuates and repeats across generations and communities. Emotional abuse involves convincing someone that they are isolated and alone. That their suffering, unhappiness and misfortune is their own making, all in their head and that they should be ashamed for experiencing it. It is through recognizing abuse as a pattern that victims find they are not as alone as we were told, and that there are connections and links even between unique and individual experiences. She Who Fights Monsters is a short look into one artist’s experience, and an invitation to explore how that experience makes you, outside the game, feel in response. You can download or purchase She Who Fights Monsters here. This entry was posted in Uncategorized and tagged indie games, jrpg, RPG Maker, survival horror. Bookmark the permalink. Happened across this from Stephen, and although I haven’t tried the game yet(which I will), I am already pretty touched by the interpretation. I am excited to play through the game and see how my lens focused with yours, either way, keep writing.